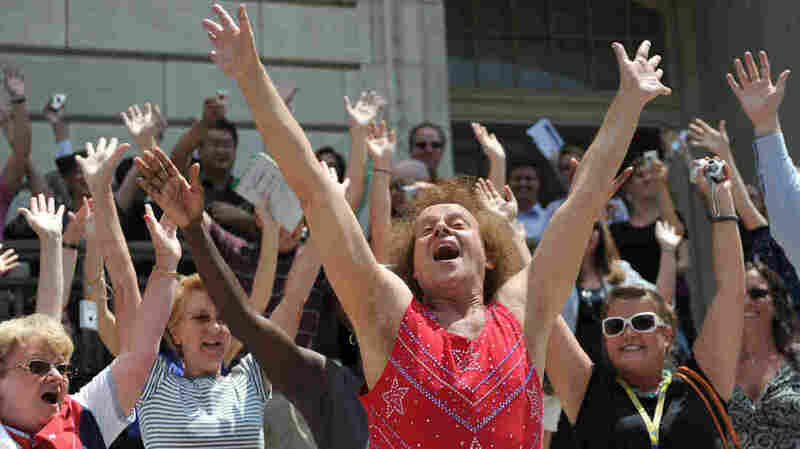 Through Thick And Thin, Simmons Is Still Sweatin' Richard Simmons opened his first aerobics studio in Beverly Hills nearly 40 years ago. Since then, he has become an international celebrity, selling millions of fitness videos and writing best-selling books. But all along the way, Simmons never stopped teaching aerobics classes at that Beverly Hills studio. NPR's Sam Sanders stopped in for a session. NPR producer Sam Sanders headed to Beverly Hills, Calif., recently to see longtime fitness guru Richard Simmons in action and find out how he has been at it so long. He sent this reporter's notebook of his encounter with the man who's been helping people lose weight for nearly 40 years. While working as a waiter, Richard Simmons saved up a year-and-a-half worth of tips to open his first aerobics studio in Beverly Hills in 1974. Ever since then, he has been planting himself in America's pop-culture psyche with dozens of infomercials and best-selling books, myriad parodies of his over-the-top persona, and seemingly endless TV and film appearances. I have to do it till the day I die. If I don't move, I'm not happy. Imagine my excitement at a dinner party last spring, when a friend of a friend told me about Simmons' Beverly Hills aerobics classes. Turns out, whenever Simmons is in town, he leads the courses himself, in that same studio he moved into nearly four decades ago. The classes are open to the public, cost only $12, and they have a cult following in Los Angeles. I knew I had to go, and record it. So, I convinced Simmons' team to let me shadow him one Saturday afternoon in May, traipsing behind the dynamo — with a big fuzzy shotgun mic in hand. When I walked into the studio, Simmons was in the middle of one of his iconic pep talks — part AA meeting, part church testimony service. He had on a handmade glittery shirt and tank-top ensemble (with two-toned tights, of course), and was circled up on the floor with a lot of people who really wanted to lose weight. As a larger, middle-aged woman started crying while telling Simmons about her weight-loss goals, Simmons broke up the tension in that earnestly wacky way only he can. He talked about his underwear. "When you lost the weight, did you buy new underwear? Doesn't it feel good to buy new underwear?" Simmons said, drawing awkward laughter. "When I lost my weight, I went and bought about 15 different types of underwear to see what would look good on my new body. It's exciting!" The next hour became a full-on dance riot. Simmons' "Sweatin' to the Oldies" soundtrack had been replaced by an incredibly modern playlist — Pitbull meets Ibiza meets Katy Perry. The crowd was mixed, men and women, straight and gay, fat and skinny. Simmons was a whirling dynamo of energy — a spastic, sweaty Svengali. He'd reach to turn down the music in the middle of a song, just to yell out affirmations: "I love you all!" or "I just wanna lick your neck!" He'd tell the sweating bodies gathered around him how dancing is just like making love. When he stopped the music for some weight lifting, he'd spontaneously burst out singing. An eight-beat countdown would be interrupted by a screeching rendition of "The Birds and the Bees." When he was really feeling the spirit, he'd craft an original, like "Go Away Chubby Thighs," which he began belting about 45 minutes in. Simmons led a dance circle in the middle of the mirrored studio, bringing writhing, shirtless and exposed bodies into the center to shake. He told one woman she was cute "like a dessert," and one unassuming man even received an offer from Simmons to wax his legs, because he was just too hairy. As Simmons told me in an interview after the class, "it's a Broadway show." "The more I bark at them and become different characters and drive them crazy, the harder they work," he said, adding that he likes the tension. "I get a little thrill out of driving them crazy, just a little." But all of it — the sweat, the innuendo, the unabashed libido — it serves a higher purpose for Simmons. As we talked in the empty studio, after he had taken photographs and signed shirts and body parts, he softly wept as he told me about the seriousness of what he does. "Even though my work is whimsical," Simmons says, "I have a very serious job. I cry more than I laugh." Contrary to popular belief, Simmons is not a jester. He is a minister. "When I go to bed at night, I ask God to give me another day," he says. "I ask him to keep me strong and make me a good teacher, and to keep spreading this right word." That "right word" — his life's work — is almost holy in its simplicity. For his entire professional life, his message has been: "Work hard, take care of yourself, and you'll be just fine." And the messenger says he's not stopping anytime soon. "I have to do it till the day I die," he says. "If I don't move, I'm not happy." By that measure, Simmons will be happy long into the foreseeable future.